What countries are these stamps from? So I have a bunch of stamps where I wasn’t sure what county they came from and was hoping some of you might already know. Can you take a look? I am not worried about a full identity at this point, just country. Row 1- Spanish Morocco, Dominican Republic, France, ? , Russia (USSR), ? Row 2- Spanish Morocco, Netherland Indies, Saudi Arabia, ? , ? , ? Row 3- ? , ? , Hungary, ? , Saudi Arabia, ? Here is a new page with more stamps. Row 3- Greece, Bulgaria, Bulgaria, ? , ?, ? Row 4- ? , ? , Serbia (I think), Russia, Russia, ? Post #1, top row, last stamp: Venezuela. Yeah, it once was the United States of Venezuela. 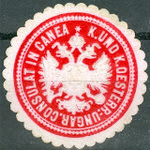 Post #1, row 4, stamp #5: This one is from right after World War I, when Russia was in the process of becoming the USSR and the states that it eventually incorporated had some degree of autonomy. I'm pretty sure this is Ukraine. Now that I look at it again, row 2, stamp #5 has a very similar device and would be of similar origin - though that one might be a Cinderella. Ukraine is one of the East European countries I have not explored in any depth. Post #1, bottom row, first "stamp": this was a label found on quite a few Belgian stamps in the early 1900s that said, "Don't deliver on Sunday." I'm not at my regular stamp desk right now so I can't tell you exactly how those labels were used, but citizens could elect not to have mail delivered on Sundays. Post #2 (or #3, depending on how you're counting), top row, last stamp: Chile. They put Columbus on most of their stamps from the beginning, going a ways into the 20th century, even though Columbus never got anywhere near there. Post #2, row 2, first two stamps: I'll have to disagree with Janet, as these are Jugoslavia. Some of their stamps had Cyrillic inscriptions, some had Latin, and some had both. The next two are Bulgaria; the first two letters with little flags pointing at each other are the giveaways. Post #2, row 2, stamp #5: Uruguay - la Republica Oriental de Uruguay, so called because it was on the east bank of the Rio de la Plata, which separates it from Argentina. I finally learned that after spending decades wondering why they had "Oriental" in their name when "Oriental" is, like, China. Post #2, row 4, stamp #3: Janet was right to pick up on Serbia in the name; it's the Kingdom of the Serbs, Croats, and Slovenes, which was the post-World War I name for Jugoslavia for a while. Gotta run now, but some of the others are Ukraine. If you can pick up Cyrillic inscriptions that begin YKPA, that's "UKRA". I can probably clear up some of the other Cyrillics later tonight if there's still need, though I expect someone will have most of them nailed by then. Yes, related to row 1, I confirmed Ukraine for the overprinted Russian stamp. Took me quite a while to find it. I discovered several more Ukraine stamps by looking for the that overprinted symbol (the Trident), the one you mentioned on row 2 turned out to be from prior to becoming part of USSR, scott number 4 for Ukraine. Row 5, stamp 2 was also Ukraine, as was stamp 5 from row 6, and stamp 7 from row 7. Those three were from an un-released set which the printer got stuck with when Ukraine joined the USSR. After I pull out the ones you already pointed out for me, I'll post a new pic since I found several of these myself this afternoon, so please don't spend any more time looking at the existing pictures. Thanks! Here is a final version, please disregard the previous pics. 4th stamp, second row in the 1st batch, and 4th stamp 3rd row in the 2nd are from Turkey. The image shows the signature of the Ottoman emperor. 1st row: 4th is from Slovenia, 5th is Serbia, and 6th is Japanese-occupied Burma. 2nd row: 1st is Austria-Hungary, 4th is French Algeria. 3rd row: 1st is Cape of Good Hope (South Africa), France, Transvaal (South Africa); 5th is Tunisia (French protectorate), 6th is Spain. 4th row: 3rd is Spain, 4th is Hungary, 5th is French Tunisia, 6th is Austria Hunagry, possibly postmarked the Laibach(now Ljubljana, Slovenia) train station. 5th row: I need a better scan, but the last might be Georgia, as it was being swallowed up by the Soviet Union. 6th row: the last two are from Czechosolovakia. 2nd row: 4th and 5th are Russia, the Russian Soviet Federated Socialist Republic - very early Communism. 4th row: 2nd is Iraq. I should know the ones on either side, but I don't. 4th row: The next to last is Bulgaria, from 1940. The last one is Bulgaria, too; I know I've seen it a million times, but right now I can't find it in my album or in my catalog. BTW, the word in the bottom bar on each stamp transliterates as Stotinka, of which 100 make a Lev. It's a handy word to know when dealing with pre-1950 Bulgarian stamps. 6th row: The first two are Bulgarian parcel post stamps from 1941: one of my fave series from one of my fave countries. 6th row: 4th is Spain, and it's a bit of a mystery. I've seen a few of these around. Scott has a set of 16 stamps issued on October 10, 1930 - the last stamps issued under the monarchy - and this ain't one of them. A 1978 Edifil catalog that I picked up cheap somewhere has another 9 stamps issued that same day that don't say "Correos" or "España" anywhere on them, and this is one of them. I couldn't find them in Michel, which may be my fault; Michel is more generous about "what's a stamp" than Scott is. Somebody with more expertise than me in the philately of Spain (which, frankly, doesn't take much) might be able to explain more precisely what they are. I've just looked at your first scan before seeing the later ones and your advice to disregard it! - Row 3 #6 is from Thailand. Row 1 #3 is from Russia. Row 2 #3 is from Finland. Row 2 #7-8 are from Mexico. Row 3 #4 is from Cape of Good Hope. Row 3 #7 is from Mexico. Row 3 #8 is from Russia. Row 4 #1 is from Spain. Row 5 #1 is from the Republic of China (Taiwan). Row 5 #2 is from East China. Row 6 #3 is from the USSR. Row 6 #4 is from Spain - Scott #C51, in the airmail half of the set that mourningdoves mentioned.